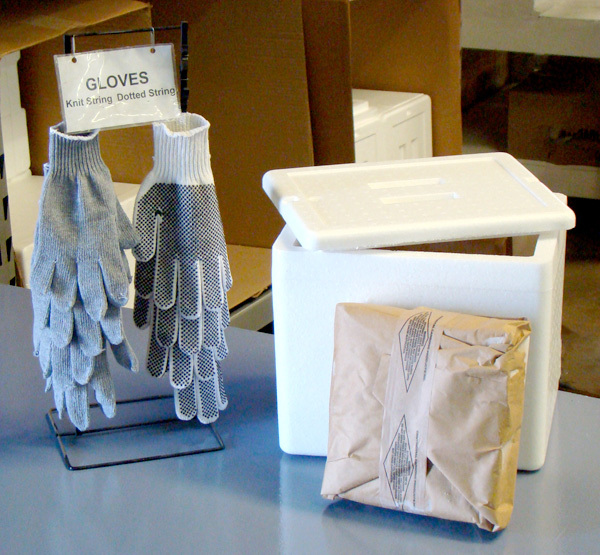 When shipped in an insulated cooler, dry ice will continue to sublimate from a solid to a gas. Click here for a dry ice frozen food packing chart. The quantity of dry ice needed depends on the size of your shipment and the length of time in transit. Click here for a dry ice frozen food packing chart. We usually sell dry ice for $2 a pound or less. The more dry ice you purchase, the less expensive it is. Dry ice is extremely cold at -109º F (-79º C), which is 141º F below freezing. Make sure you wear gloves when handling dry ice. Dry ice is pure, solid carbon dioxide (CO2). It's called dry ice because it changes from a solid to a gas and never melts into water. Dry ice is a versatile product that has a number of commercial and consumer uses. Click here to find out about dry ice uses and applications. Continental Carbonic has 45 locations across the United States and Canada where the public can get dry ice on a walk-in basis. We cannot accept walk-ins at our Martinez, CA or Washington, IN locations. Click here to see a complete list of our locations or use our dry ice locator to find the location nearest you. How to ship with dry ice? Click here to find out how to ship items with dry ice according to postal and shipping regulations. Before you purchase dry ice, please read our dry ice safe handling precautions. Dry ice is -109º F, which is cold enough to freeze skin cells, causing an injury similar to a burn. Never allow dry ice to come in contact with skin. Always handle dry ice with protective gloves or a towel. Dry ice converts to carbon dioxide gas so if left in a confined space it will displace oxygen and present a suffocation hazard. If dry ice has been in a confined space (e.g. a closed car or room) for more than 10 minutes, open the doors and windows before entering or you could experience difficulty breathing. Leave the area immediately if you start to breathe quickly or have any difficulty breathing. Do not store dry ice in a container that is completely airtight. As the dry ice sublimates to carbon dioxide gas, it will cause an airtight container to expand and possibly explode.